The Estradiol kit is intended to quantify 17b-estradiol from cells, serum, and in biochemical assays. There is substantial research indicating that breast cancer tissue contains the enzymes necessary to synthesize estradiol (17ß-estradiol), a steroid hormone that plays an important role in this disease. Two main pathways are involved in the formation of estradiol in breast cancer tissues: the aromatase pathway, which transforms androgens into estrogens, and the sulfatase pathway, which converts estrone into estradiol via the 17ß-HSD1 enzyme. 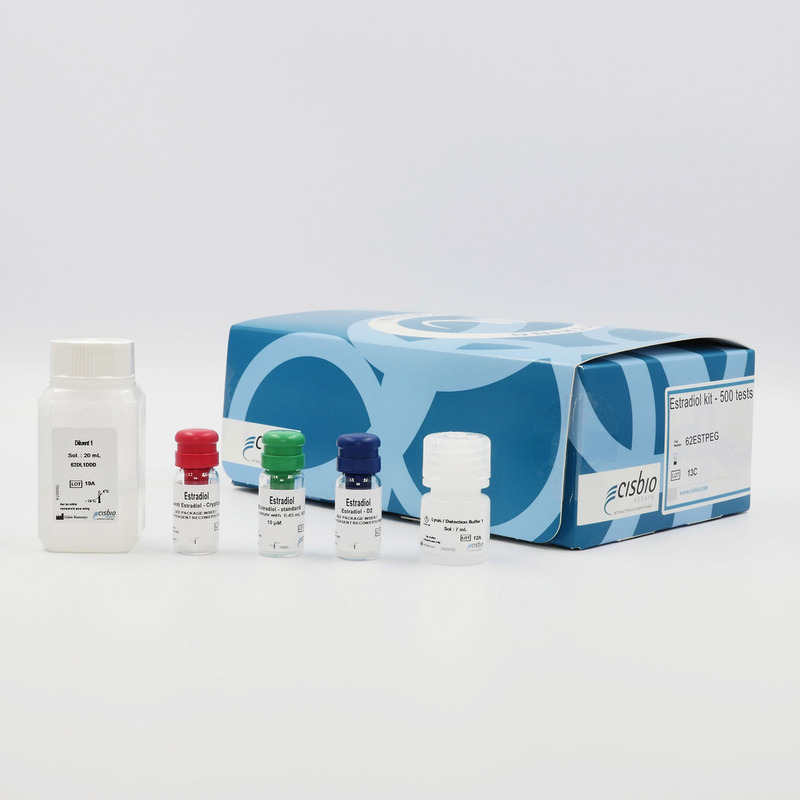 The Estradiol kit is a highly specific assay for measuring estradiol in whole cells, cell supernatants, or biochemical enzyme assays. The kit is based on a competitive format involving a specific antibody labelled with Cryptate (donor) and estradiol coupled to XL665 (acceptor). Estradiol produced by cells or purified 17ß-HSD1 enzyme competes with XL665-labelled estradiol for binding to monoclonal anti-estradiol Eu Cryptate. The estradiol assay features a streamlined protocol with only two incubation steps: - Cell stimulation by target compounds - Estradiol detection using HTRF reagents This protocol requires only a single, two-hour incubation period following cell stimulation. A human breast cancer cell line, T-47D, was tested for the production of estradiol when stimulated with estrone using the HTRF Estradiol assay. Assay reagents were added directly to the cell culture plate following cell stimulation. As Figure 2 shows, estradiol was detected using as few as 780 cells. The ability to miniaturize and run the assay in a single plate while not sacrificing assay performance makes HTRF Estradiol an ideal tool for screening. T-47D cells were dispensed as indicated into 96-half-well plates. 50 µl MEM containing 10 nM Estrone were added and cells incubated for 20 hours. Estradiol assay reagents were added directly to cultured cells. Following a 2 hour incubation, fluorescence signals were read and estradiol concentrations calculated using a standard curve.